Stepping into the Alice Neel exhibition currently on view at David Zwirner felt like I had entered directly into the artist’s psyche and memory banks. 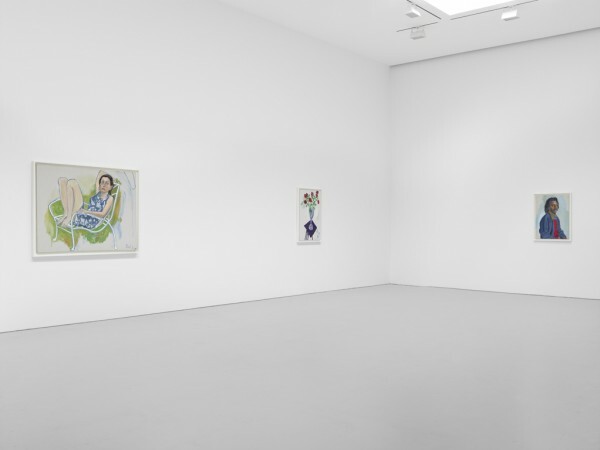 The show is sparsely hung with selections from the late artists estate, most being portraits of her friends and cohorts made between 1964 and 1983; the last two decades of Neel’s life as a painter in NYC. Ample white space between the hung images and the uniform white frames on all of the paintings create an environment of calm reflection, as the interior lives of her subjects peer out at us from within their surfaces. Neel’s uncanny ability to capture her subjects psychological states in the moments they sat in front of her reads intensely in person. The personalities reveal themselves through Neel’s fluid handling of paint; stories unfolding, lives and past moments cascading into the present. I immediately wanted to know more about the lives of the people she was surrounded by. Juxtaposed realism and abstraction live side-by-side within Neel’s works; linear outlines of figures combine with rendered form and moments of flat space adding to the dynamism of these portraits. Most of the portraits in the show are centrally composed, and like the show itself, Neel frames her compositions with room to breathe; subtle absences of detail creating worlds within, leading our eyes on a visual journey. Limbs are often cropped and pushed right up to the edge of their frames, negative and positive space create rhythms and patterns, and hint at the formalist way she moved around the canvas. Neel’s study Nancy, 1978, of her reclining daughter-in-law Nancy Neel, wife of her son Richard, caught my eye. The expressionistic and bold, blue outlines searching out shapes and angles, the lines disappear as a more realized face emerges. Tension is created within the centrally placed figure in the triangular composition through use of gestural marks next to the more developed facial features, an eerie contrast. Another highlight of the exhibition is Neel’s portrait of Fluxus forerunner artist Geoffrey Hendricksand then partner, the late Brian Buczak. 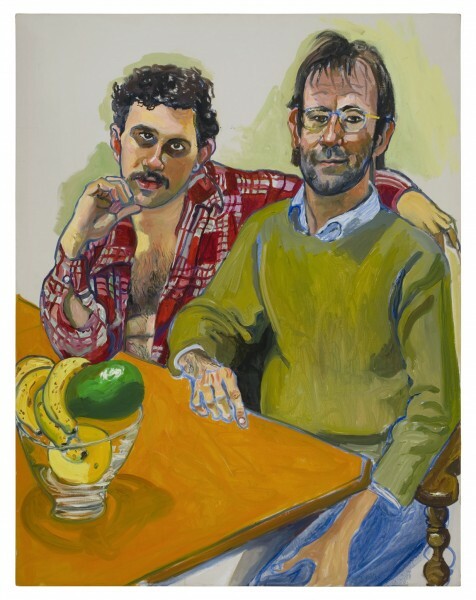 Humor and tenderness are brought into the portrait of the couple, who Neel painted sitting at her kitchen table behind a suggestive still life of phallic bananas languishing across a lush green avocado. Neel’s still lifes in the show exemplify her ability to bring life into her medium, objects take on energy of their very own, placeholders for people and existing as portraits in their own right. 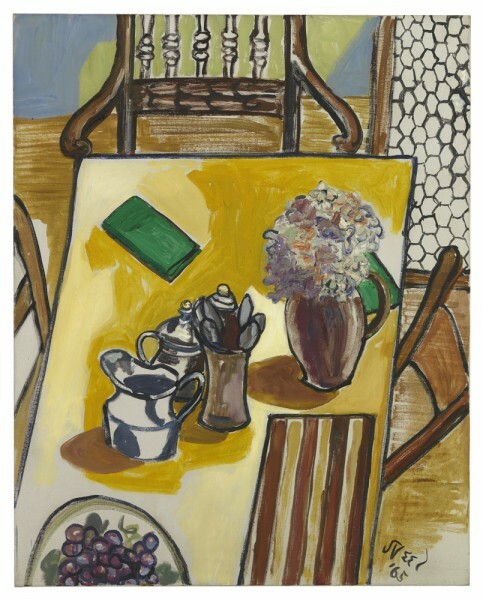 In Still Life (Breakfast Table), 1965, spoons, jars and the vase of flowers on the table are the lively inhabitants of their own universe, gathering in the center to perhaps converse and catch up on the latest within their world. 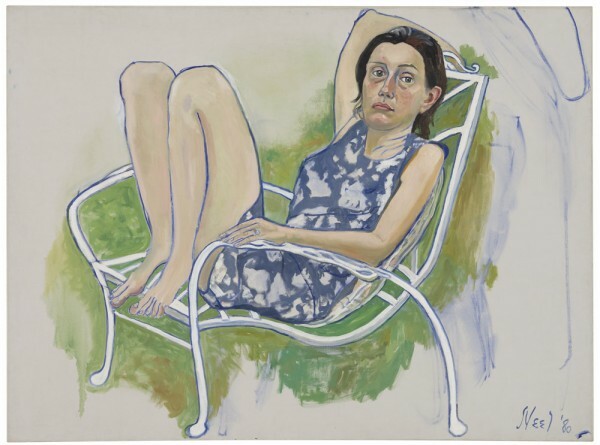 While Alice Neel is no longer with us her paintings live on, and this exhibit presents some of her very best, most poignant works from her later period. Neel was a marginalized painter who stood her ground during her career, famously upholding her interest in figurative art when it fell out of fashion and became sublimated by the more hip, male-dominated Abstract-Expressionist movement. Alice Neel is truly a hero for vagabond artists, bohemians, and especially emerging female artists everywhere.